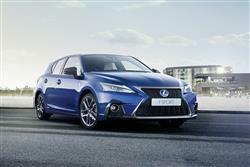 The F Sport trim level represents the top of the CT200h range and will set you back around £28,000. The line-up as a whole begins at £23,500. Whichever version of this Lexus you choose, you'll find plenty fitted as standard. Things like alloy wheels, Bluetooth compatibility for your mobile 'phone, USB compatibility for the stereo and rain sensing wipers would all cost you more in a comparable BMW 1 Series or Audi A3. Plus there's rear privacy glass, a high quality 6-speaker CD stereo, a leather-covered steering wheel, dual-zone climate control and UV-glare-reducing windows. The F Sport model gets a bodykit, a sharper look and black leather upholstery amongst other extras. Safety-wise, a 5 star Euro NCAP showing is justified by the inclusion of no fewer than eight airbags, including knee protection for driver and passengers. Plus of course, it goes without saying that the CT has the full complement of electronic braking, stability and traction controls. You'll need to pay extra though, for Lexus' PCS pre-emptive Pre-Crash Safety System which radar-monitors the road ahead to detect potential hazards. Should one threaten, it will alert the driver, pre-tension the safety belts and automatically help with braking. The system comes packaged with Lexus' ACC Adaptive Cruise Control which uses the same gadgetry to maintain a safe distance to the car in front.